As I might have mentioned once or twice...ok, ok, actually a bunch of times, I love to host a good party! There's always a reason to celebrate, and throughout the many years of parties & events, I've found things that worked, others that didn't, and learned a thing or two about making entertaining fun, stress-free, and beautiful. 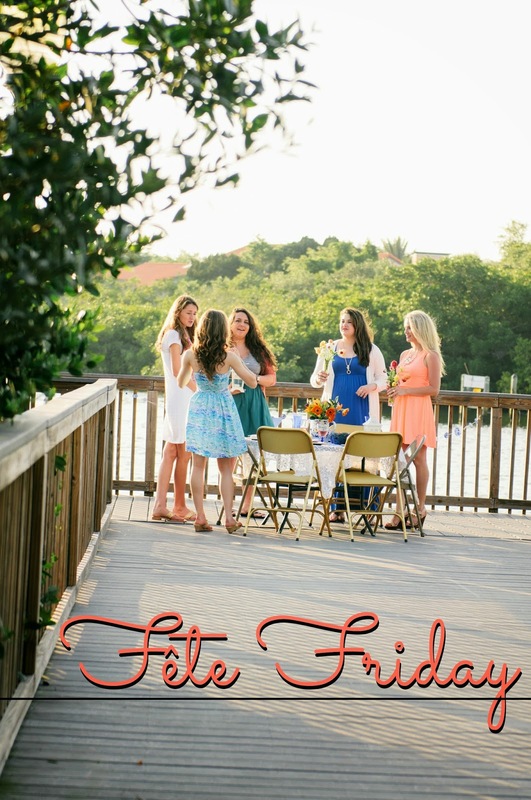 After many emails from readers about where to find this, or how to make that, or even the process from paper pad to party, it seemed only natural to designate a day on here to answer questions, share ideas and inspiration, as well as some tried and true recipes, so I'm introducing Fête Friday. What's a Fête, you ask? A lavish party, yes please! Sounds fitting, right? We all want to throw the most fabulous of parties... ones that will be enjoyed, talked about, and remembered for all the wonderful memories, good times with friends, delicious food, and your amazing skill as a host! Enough gabbing though, let's jump right in! So, where do we begin? Glad you asked! Whenever a celebration is to be had, the best place to start is your inspiration. Often times, we throw parties around holidays and major events, so those may have a pre-existing theme, but you might be wanting to do something a little different, so start by finding what speaks to you! Maybe that is a theme, person, a color, team, game, book, movie, an idea or even a random something that struck you as a great thing to throw a celebration about! Choose whatever inspires you, or fits the occasion, and begin with a few ideas that relate. Here's an example: My recent Christmas party was inspired by the book, and recent film adaptation of F. Scott Fitzgerald's, The Great Gatsby. The idea of hosting a 20's themed soiree seemed so enticing, and it was actually a stack of art-deco printed napkins that set me on the hunt to find pieces to emulate the glamour of that era for this year's holiday party! When I began to piece together how I wanted to throw the party, I started with a little research. Some of the scenes from the book, as well as the movie, depicted the lavish, sparkling decor of that time, so I chose my theme colors from that, black, gold and white. Next, I loved the idea that the movie brought up, which was the fact that actual parties from the 20's had this thing for animals, like zebras and lions, and so I chose to toss a few golden creatures into my table decor. What helps me is to put together an inspiration board of color palettes, tablescapes, decor ideas, recipes, and other party pieces that all help to bring your theme to life. My Party Inspiration board on Pinterest is constantly being updated with ideas that will help plan my next event! (hint: you can always tell when something exciting is in the works, due to the massive amounts of themed pins on that board!!) 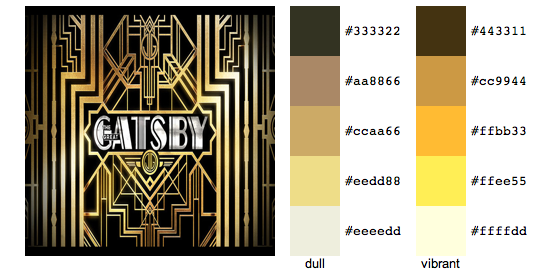 If a particular photo inspires you, I enjoy using the ColorPalette Generator or Design Seeds for color combinations! Pinterest is also extremely helpful when it comes to locating photos and ideas of others who may have hosted similar or related events, as well as any random ideas you might want to incorporate into your fabulous fête (been there, done that!). So, you've narrowed down the theme, picked your colors, and now you're ready to move on to the next step, choosing your menu! Next week, we'll dive into your meal planning, when to buy vs. make, and...I may even have a few tried and true recipes for you, yum!! What a beautiful and inspiring new theme for your friday posts! I have yet to experience one of your eloquent fetes! Here's hoping we can make it happen in 2014! Happy New Year love! i cannot wait to move out so i can have parties!!!! dyyyying to have my own space. @Stephanie--No need to wait! Host one in a park, at the beach, in a garden, even at home :) As long as you make it special, it won't matter if it's your own space or not!